Okay, 24″ of our Snowpocalypse #4 shoveled & plowed from our 150′ driveway this weekend, check. Daily call (for 3 weeks now) to hardware, big-box stores to learn if any snow rakes are available for sale, check. Oh wait, it’s 7AM on President’s Day, and Home Depot just unpacked 4 pallets of roof rakes. I quickly brushed two feet of fluff off the car and headed out to Seabrook, NH, about 20 minutes from my Northern Massachusetts home. I got there by 8AM and half the rakes had already been sold! The picture to the right shows that after only 1 hour, I had cleared 2′ of packed snow and ice off the right hand gabled roof and 4′ off my dormer area, yeah! I was determined to help a group of Olin College of Engineering sophomores with their first phase of a design project. Ten students were to come, but only 4 braved the post blizzard snow to get here. As you can see in this picture below, I was able to relieve my roof of 90% of the 80.5 inches of snow we have received over the last few weeks in the New England area. Just as I finished, the students called. They were stuck in the snow themselves trying to get here! What a winter, yikes! Using techniques learned from surviving many Minnesota winters; we worked as a team and freed the sedan from a 5′ snow drift! 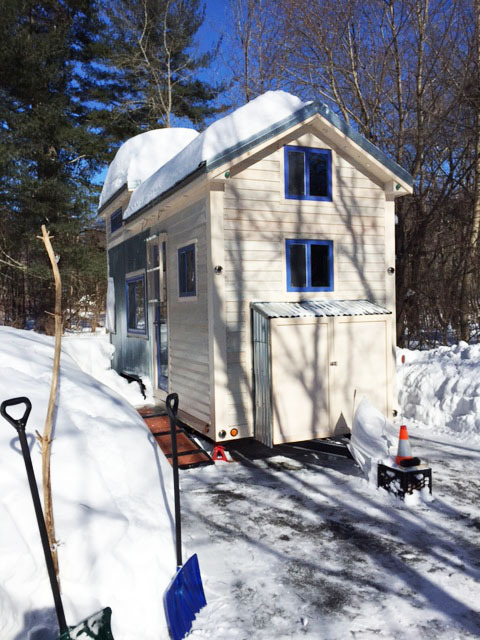 Over the next two hours, we explored my tiny house challenges, my design and build process. These students were animated, excited and very interested in obtaining knowledge about tiny house builders, their motivations, their process, and challenges as they begin their tiny house project. I encourage the tiny house community to invite these engineers (there are several groups doing this project) to learn about your tiny house journey. 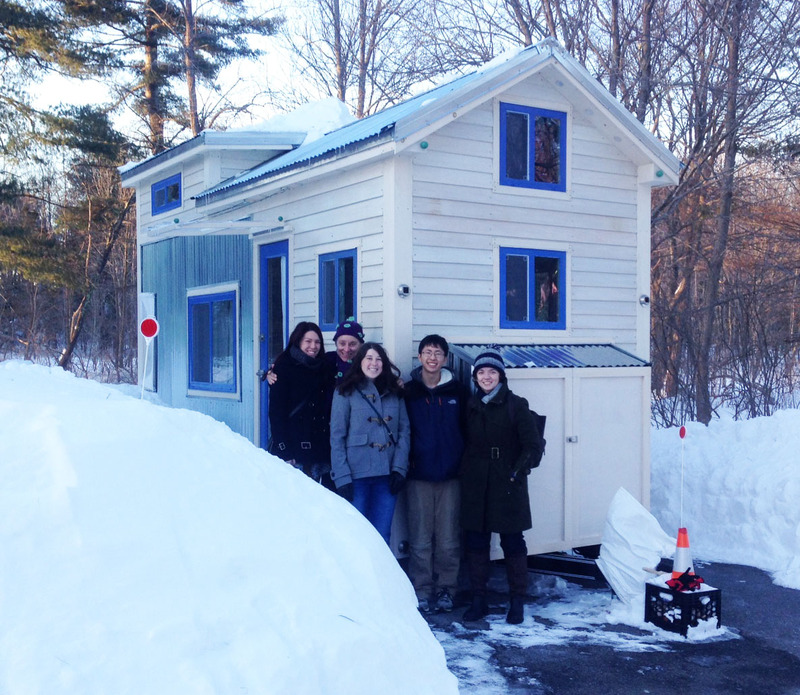 Contact them at olintinyhouses@gmail.com to be interviewed. ← Snowmageddon #3 or is it Snowpocalypse #4?